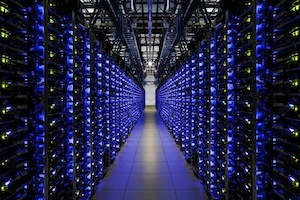 Google servers are different. Since 2001, we've been designing them to be more efficient. For many years now, we've used very efficient power supplies. Similarly, we use highly efficient voltage regulator modules to ensure that most of the power goes to the components that do the actual computing work. We’ve cut out two of the AC/DC conversion stages by putting back-up batteries directly on the server racks. We estimate an annual savings of over 500 kWh per server—or 25%—over a typical system. We encourage all of our suppliers to produce parts that operate efficiently whether they’re idle, operating at full capacity, or at lower usage levels—an idea we introduced as "energy proportionality" in 2007. Our study shows that more energy-proportional systems can cut total energy use in half at large data centers.